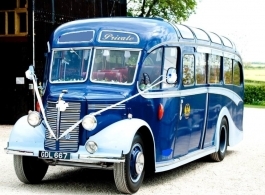 This 29 seat vintage wedding bus is a 1950 Bedford OB in two tone Blue with beautiful Red seating. An ideal mode of wedding transport for the bridal party, family, friends and wedding guests, the vintage Bedford has a full length, opening sliding roof which is great for warm summer days and looks brilliant in wedding day photos. If you have in excess of 29 passengers and the journeys are very local then two trips may be ok but if you need a second vintage bus then we can also offer the Red, 33 seat 1940s bus (vehicle code 0479).